Maurice Hugh Frederick Wilkins CBE FRS (15 December 1916 – 5 October 2004) was a New Zealand-born English physicist and molecular biologist. Wilkins was born in New Zealand to a family from Dublin. When he was six, he moved to Birmingham. His research contributed to the understanding of phosphorescence, isotope separation, light microscopy and X-ray crystallography. He worked on the development of radar during World War II, and was a member of the Manhattan Project. He is best known for his work at King's College London on the structure of DNA. In recognition of this work, he, Francis Crick and James Watson were awarded the 1962 Nobel Prize in Physiology or Medicine, "for their discoveries concerning the molecular structure of nucleic acids and its significance for information transfer in living material". His obituary provides extensive information on the topics mentioned here. Wilkins was the Assistant Director of the Biophysics Unit at Kings College, and responsible for work on the structure of DNA. 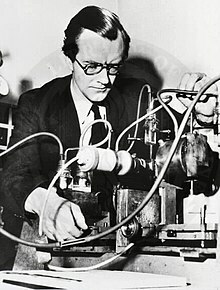 Wilkins and a graduate student, Raymond Gosling, got the first X-ray diffraction photos of DNA in 1950. He introduced Francis Crick to the importance of DNA, and hired Rosalind Franklin on a three-year grant. Franklin made progress with the crystallography, and produced some better photographs of the structure. In 1953 Watson visited King's, and Crick got sight of a progress report. This report included useful information from Franklin about features of DNA she had deduced from her X-ray diffraction data. Watson and Crick published their proposed DNA double helix structure in a paper in the journal Nature in April 1953. In this paper Watson and Crick acknowledged that they had been "stimulated by.... the unpublished results and ideas" of Wilkins and Franklin. By this time Franklin was suffering from cancer of the ovary. She died in 1958, which explains why she was not included in the 1962 Nobel Prize. A controversy exists as to the relative contributions of her and Wilkins. ↑ S. Arnott, T.W.B. Kibble and T. Shallice, Maurice Hugh 2006. Frederick Wilkins CBE: 15 December 1916-5 October 2004. Biographical Memoirs of Fellows of the Royal Society, 456--478. This page was last changed on 9 December 2018, at 11:42.